how was your christmas? mine was relaxed: my mom and i made gingerbread house mug toppers and bibimbap with my cousin, and then the rest of our families came over for bibimbap and dessert (salted caramel bread pudding that was tasty even if the caramel seemed to have disappeared and it tasted more dutch baby like than bread pudding like). chances are, if your holidays have been anything like the gluttony of mine, you don’t need cookies. nonetheless, let me shove a recipe for some at you. these peppermint mocha cookies are super fudgy and chocolatey and rich. plain, they’re amazing. dipped in chocolate and crushed peppermint candy? they become the OH MY GOODNESS I’LL HAVE 5 RIGHT NOW kind of good, what with even more of a pepperminty kick, a bit of crunch, and more chocolate, hehe. maybe you need more convincing. 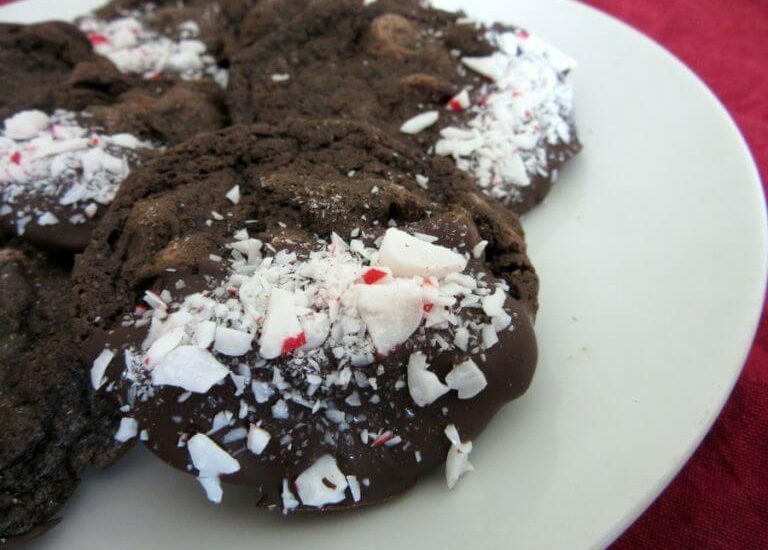 whatever, another chocolate peppermint (even though technically it’s peppermint mocha) cookie. but my family of 4 ate all of these in 4 days. and this was with an abnormal amount of sweets in the house including matcha/peppermint/nutella truffles (not together), some cupcakes i’ll be sharing on the blog in a couple of days, macarons from a friend, and a banana chocolate almond croissant from a bakery i’ve been meaning to check out for a while. Beat the butter until smooth and creamy. Add the sugars and beat until fluffy and light in color. Beat in the egg and extracts. In a separate bowl, whisk the dry ingredients until combined. Slowly mix into the wet ingredients until combined. The dough will be quite thick. Beat in the milk, then the chocolate chips. The cookie dough will be sticky. Cover dough tightly with plastic wrap and chill for at least 3 hours (preferably overnight) and up to 3 days. Remove dough from the refrigerator and let sit at room temperature for 20-30 minutes. Scoop 1 1/2 T portions (you’ll get 20-22) and roll them into balls. Place them on parchment or silicone lined baking sheets, spaced a couple inches apart. Bake at 350F for 8-9 minutes. The baked cookies will look extremely soft in the centers when you remove them from the oven. Cool completely on the pan before transferring to a wire rack- they’re too fragile while warm to move them. They will deflate (she says slightly, I say significantly) as they cool. Dip each cookie halfway into the melted chocolate and place onto a parchment or silicone baking mat-lined baking sheet. Sprinkle candy on top of the chocolate. Wait for the chocolate to set (you can refrigerate the cookies) before serving.